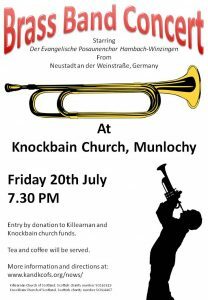 On Friday 20 July 2018, at 7:30pm, the Posaunenchor Brass Band, from Germany, will be in concert in Knockbain Church. They are a multi-award winning band, who play a range of music from classical to rock and pop and everything in between. This is their second visit to Knockbain church, having come while on tour in 2016.